This well-known global chain of rock ’n’ roll-themed restaurants opened the doors of its Amsterdam location in 1999. Equal parts restaurant, bar, and museum, the Hard Rock Café Amsterdam offers traditional American fare, inventive cocktails, and authentic memorabilia from John Lennon, Jimi Hendrix, Van Halen, and more. Although Hard Rock is an American-themed café—from the food and cocktails to the memorabilia and booming rock music that fill the space—each Hard Rock Café is unique, blending in a local city vibe. Located in the heart of Amsterdam with canal-side outdoor terraces and a lively bar, the Amsterdam branch has a fun, party-like atmosphere. Visitors enjoy traditional American fare, from burgers and salads to barbecue ribs and mac-and-cheese in a lively setting. Between courses, you can peruse the rock memorabilia on display, including a leather jacket that belonged to Bob Dylan, a beaded belt worn by Jimi Hendrix, a bass guitar played by Gene Simmons of Kiss, and more. There is also a gift shop on-site that sells Hard Rock merchandise. The Hard Rock Café is a great spot for American-style food in Amsterdam in a lively setting. Hard Rock Café Amsterdam is immensely popular, so book seating ahead of time online to avoid long wait times for a table. You can visit the on-site gift shop without dining in the restaurant. 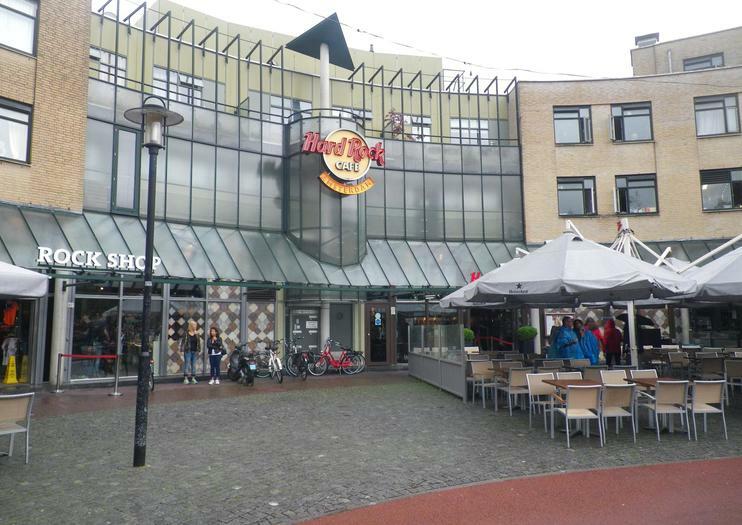 Hard Rock Café Amsterdam is located at Max Euweplein 57 alongside the Singelgracht canal. The café is located in the heart of Amsterdam’s Leidseplein entertainment district, within walking distance of the Holland Casino and the popular Paradiso live music venue. The Hard Rock is easily reached via tram lines 1, 2, or 5 from the Amsterdam Centraal train station. Hard Rock Café Amsterdam is open year-round, including holidays, for lunch, dinner, and late-night snacks. Reservations are strongly recommended at all times of the year due to the immense popularity of the café. To avoid long wait times, consider prebooking priority seating, which includes a 2- or 3-course dinner. Collectors seek out Hard Rock fashion and collectible merchandise from locations all over the world. Each Hard Rock Café sells merchandise unique to its location with Hard Rock Cafe’s signature logo and the city name emblazoned on pins, T-shirts, hats, jackets, and accessories. Take home a memento of your experience at Hard Rock Café Amsterdam. Fejr rock-and-roll-livsstilen under dit besøg på Hard Rock Café Amsterdam. Tjek caféens samling af musikalske memorabilia, herunder et sølvkropsdrag, der bæres af Marilyn Manson til en Versace shoot, en akustisk guitar brugt af Jimi Hendrix og Eddie Van Halen's varemærke Kramer guitar. Grav ind i mængden-behagelig mad og shoppe til souvenirs på butiksstedet.